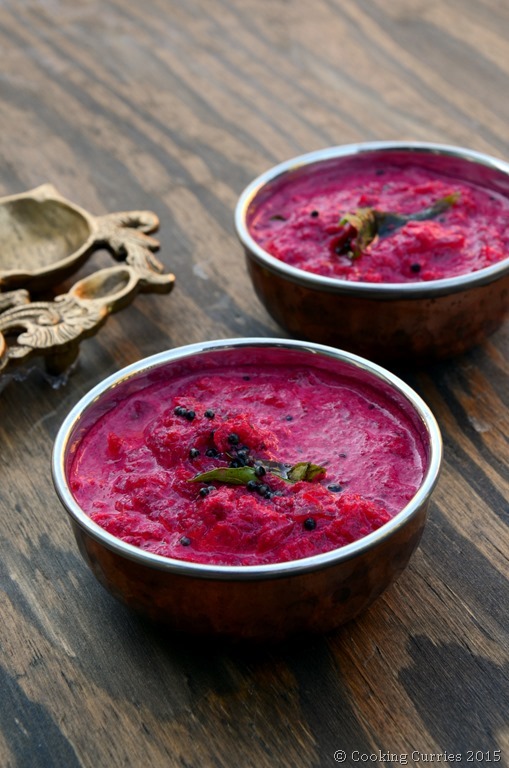 Beetroot Kichadi, also known as Beetroot Pachadi, is a delicately sweet and tangy raita-like dish where cooked beets are mixed together with a tangy and spicy ground coconut and yogurt base. This pink yogurty sauce thing always fascinated me when I was a child. I had had it only during weddings of mallus (slang for Malayalees, natives to the state of Kerala). Being a TamBrahm (Tamil Brahmin, from the state of TamilNadu), this was not something made at home, even for sadyas and it always attracted me. Maybe it was the color, maybe it was something else, I don’t know. I did not even know that it was beetroot, till maybe when I started cooking. 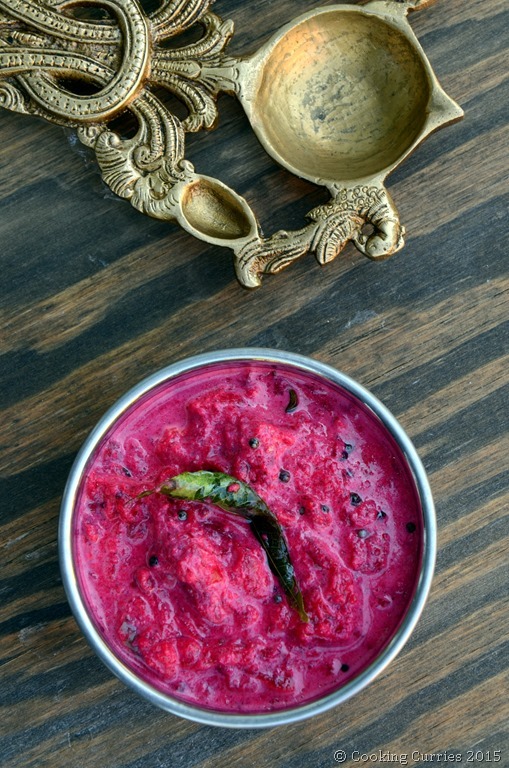 Ever since, this kichadi has been something very dear to me and I try to make it whenever I can. Cook the grated beets in water with salt added. Cook through till most of the water is absorbed. Grind all the ingredients under “To Grind to a Paste” to a fine paste, adding the yogurt towards the end, to make sure the coconut grinds properly. Add this to the beet mixture, mix well and let it cook for a couple of minutes under low heat. Do not keep it on high heat as the yogurt might curdle. 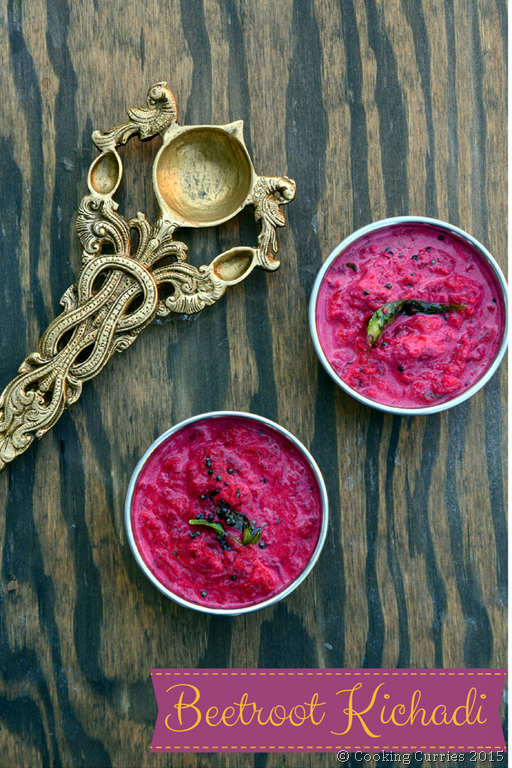 Heat the oil for tempering, add the mustard seeds, once they splutter, add the curry leaves and pour over the beet and coconut-yogurt mix. Grind all the ingredients under "To Grind to a Paste" to a fine paste, adding the yogurt towards the end, to make sure the coconut grinds properly. This sounds amazing and absolutely unique! I would love to feature it on Just Beet It. Let’s chat! It would be lovely to interview you. Your blog is fantastic! Sure Aarika! I would love that!